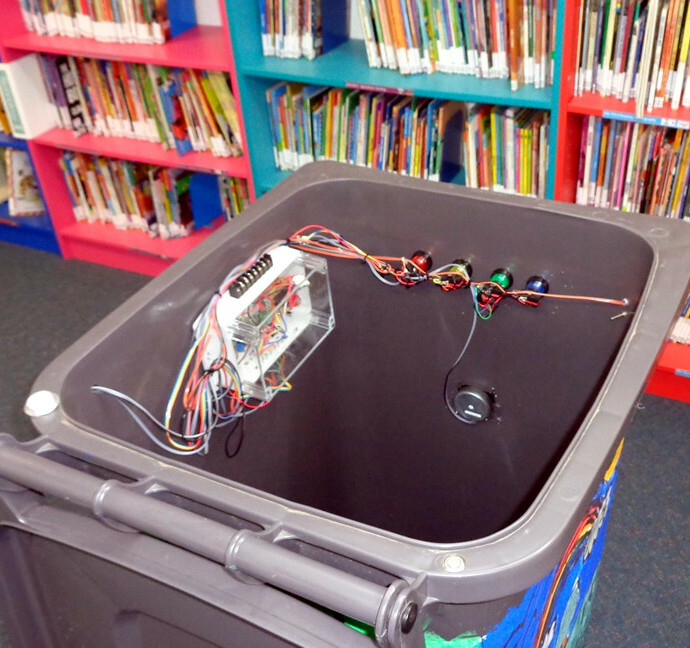 [Robert Hart] writes in to tell us about a project that challenged elementary school students to help make sure their peers put trash in its place. The kids came up with some predictably imaginative ideas like a robot to chase down litterers, but as us grown up hackers know all too well, budget and practicality often end up dictating the project’s final form. In the end, they came up with a talking trash can that gives words of encouragement to passerby. The heart of the system is an Adafruit Audio FX sound board, which has been loaded up with audio clips recorded by the students. The buttons on the front of the can trigger different messages about why it’s important to make sure trash is disposed of properly, and an internal switch allows the can to thank the user for their deposit when the lid has been opened. A PIR sensor on the front of the can detects when somebody gets close, and plays a message reminding them to make use of the trash cans provided on the playground. It’s not everyday that a child has a garbage can talk to them, so we think this is a fantastic idea for getting a kid’s attention. In keeping with the ecological friendly theme, the whole system is powered by a small solar panel which charges an internal 3.7V LiPo battery with the help of an Adafruit PowerBoost 500. Electrical engineer and music enthusiast [Freidrich Trautwein] was dissatisfied. He believed that the equal tempered scale of the piano limited a player’s room for expression. And so in 1930, [Trautwein] and an accomplished pianist named [Oskar Sala] began work on an electro-mechanical instrument that would bring the glissando of the string section’s fretless fingerboards to the keyboard player. [Trautwein] called his creation the Trautonium. Sound is produced in the instrument by sawtooth frequency generators. It is then passed through filters and manipulated by the resistive string-based manuals. Frequency and intonation are varied relative to the position of the player’s finger along a length of non-conductive string and to the amount of pressure applied. This resistive string is suspended above a conductive metal strip between a pair of posts. A small voltage is applied to the posts so that when the string touches the metal strip below, the player manipulates a voltage-controlled oscillator. A series of metal tongues, also non-conductive, hover above the string. These are placed at scale intervals and can be used like keys. This early synthesizer is capable of producing many kinds of sounds, from crisp chirps to wet, slapping sounds and everything in between. In fact, all of the sound effects in Alfred Hitchcock’s thriller The Birds were produced on a modified Trautonium by the instrument’s one and only master, [Oskar Sala]. He went on to score hundreds of films by watching them with the Trautonium at his fingertips, recording and layering his compositions into an eerie wall of sound.